Pork Loin Roast - 2.1-2.7 lbs. All Natural, Pasture and Forest Raised, GMO FREE! Pork Loin Roast. 2.1-2.7 lbs. All Natural, hormone and antibiotic free. GMO FREE . Our Pork is raised by rotational grazing and environmentally sustainable practice with no hormones, or chemicals. Each one of our animals are raised on a pasture based, local farm to market model that heals the land, heals the food, and heals the culture one bite at a time.USA / Indiana / Madison CountyIN ADDITION TO OUR FIRST FRUITS FAMILY FARMS LABEL, YOU WILL ALSO NOTICE THE PROCESSORS LABEL FROM THIS OLD FARM. Q: How many does one serve? A: The 2.1-2.7 Pork Loin Roast will serve 4-5 individuals. 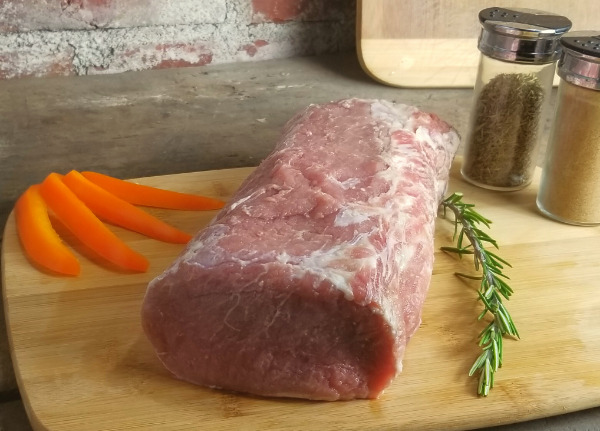 April 25th, 2019 person_outline Ann R.
A: Our pork loin roasts are vacuum packed in clear packaging so we can try to chose one that looks like it has more fat on it.